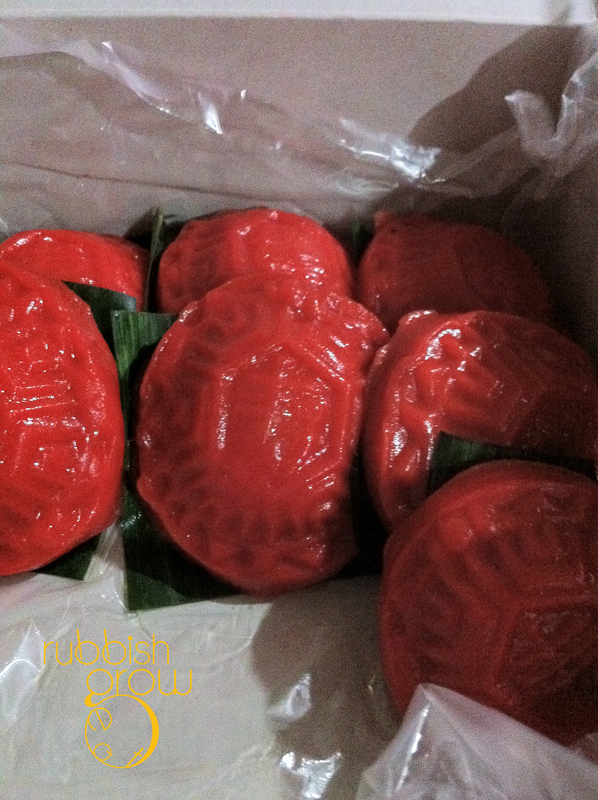 Tortoise symbolizes longevity so eating ang ku kueh (AKK or Red tortoise cake) is something auspicious (and conversely, it’s inauspicious to eat so much turtle soup because you’re taking away the life of a sacred animal and your life will shorten in retribution). In the center of Borobudur Snacks Shop’s AKK is clearly embossed “寿” or longevity. Very auspicious! I don’t like the taste of AKK in general but look at how big and fat were the AKK, like a fat baby’s fist and ONE ENTIRE BOX of them. They were irresistible, the BEST AKK I’ve ever eaten. The texture was so full and firm that it filled up the mouth, making it very addictive and chewy. Look at how the AKK glistened with all that oil (lard? ), making it smooth, such that the glutinous-rice skin doesn’t cause the AKKs to stick together, and preventing the skin from sticking to your teeth. The filling–or is it feeling?–was strange in a good way because it seemed to be a mix of peanut AND lotus paste (usually it’s just one flavor). The complex favors, with aroma of banana leaf, were fun and delightful. The AKK was so huge that I ate two for lunch and a glass of milk and was full. Then two for tea…and two for dinner…and until I finished the entire box all by myself. That’s how my mother makes sure I’ll be single for the rest of my life, by keeping me fat. PS: No tortoise is harmed in the making of AKK. Agree! other flavours available too. Super good AKK! I wanna have some now! Will check out the Ang Ku kueh. My mum loves it. yay! you try some too. They are awesome. I never paid close attention before.but they really do look like tortoise shells. I actually love these with the lotus paste filling. Bedok seems to have a lot of good food. most of the times, the AKK are not embossed properly to look like tortoise shells.